It's a familiar story—the mighty dinosaurs dominated their prehistoric environment, while tiny mammals took a backseat, until the dinosaurs (besides birds) went extinct 66 million years ago, allowing mammals to shine. Just one problem—it's not true. A new article in the Proceedings of the Royal Society B reports that mammals actually began their massive diversification ten to twenty million years before the extinction that ended the age of the dinosaurs. "The traditional view is that mammals were suppressed by the dinosaurs' success, and that they didn't really take off until after the dinosaurs went extinct. This study shows that therian mammals, the ancestors of most modern mammals, were already diversifying before the dinosaurs died out," says lead author David Grossnickle, a Field Museum Fellow and PhD candidate at the University of Chicago. The old hypothesis hinged upon the fact that many of the early mammal fossils that had been found were from small, insect-eating animals—there didn't seem to be much in the way of diversity. But over the years, more and more early mammals have been found, including some hoofed animal predecessors the size of dogs. The animals' teeth were varied, too. 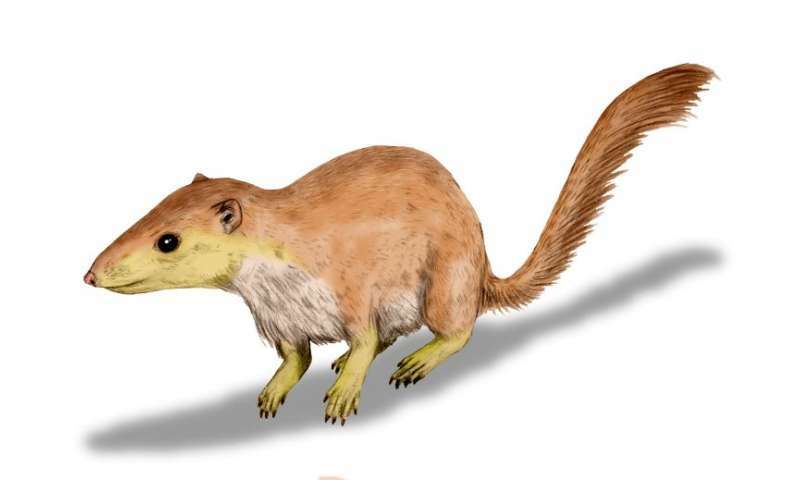 Grossnickle, along with his co-author Elis Newham at the University of Southampton, analyzed the molars of hundreds of early mammal specimens in museum fossil collections. They found that the mammals that lived during the years leading up to the dinosaurs' demise had widely varied tooth shapes, meaning that they had widely varied diets. These different diets proved key to an unexpected finding regarding mammal species going extinct along with the dinosaurs. Not only did mammals begin diversifying earlier than previously expected, but the mass extinction wasn't the perfect opportunity for mammal evolution that it's traditionally been painted as. Early mammals were hit by a selective extinction at the same time the dinosaurs died out—generalists that could live off of a wide variety of foods seemed more apt to survive, but many mammals with specialized diets went extinct. The scientists involved with the study were surprised to see that mammals were initially negatively impacted by the mass extinction event. "I fully expected to see more diverse mammals immediately after the extinction," said Grossnickle. "I wasn't expecting to see any sort of drop. It didn't match the traditional view that after the extinction, mammals hit the ground running. It's part of the reason why I went back to study it further—it seemed wrong." The reason behind the mammals' pre-extinction diversification remains a mystery. Grossnickle notes a possible link between the rise of mammals and the rise of flowering plants, which diversified around the same time. "We can't know for sure, but flowering plants might have offered new seeds and fruits for the mammals. And, if the plants co-evolved with new insects to pollinate them, the insects could have also been a food source for early mammals," he says. The article comes at a time when paleontologists are debating whether dinosaurs were already declining before the mass extinction, notes Grossnickle. "If you believe that dinosaurs were already on the downswing before the asteroid hit, this is an interesting counterpoint, that mammals were already on the upswing." Grossnickle notes that the study is particularly relevant in light of the mass extinction the earth is currently undergoing—"The types of survivors that made it across the mass extinction 66 million years ago, mostly generalists, might be indicative of what will survive in the next hundred years, the next thousand." People always fall for the dramatic narrative. The truth is usually more complicated and more mundane. Some folks can best relate to being a descendant of the mammal in the picture. And some can best relate to having descended from an ape mama. But there are many folks who may best relate to being descended from the bed bug mama in the advertisement below the article. From the stupid and freakish behavior of a large percentage of humans today, it wouldn't be too surprising if bed bug DNA could be a part of who they are. Except for the fact that bed bugs don't make war on other bed bugs. LOL I personally enjoy watching the original "King Kong", the eighth wonder of the world. The second version was ok. But the one in black and white gave an aura of dread and high adventure. Why is there reference to a "decline" ? The fact is that mammals were diversifying, but this doesn't mean that dinosaurs were in decline. It may mean that there were more niches available to be occupied by micro-mammalia or even bigger mammalia, but this doesn't mean that they forcibly had to "steal" niches that were occupied by dinosaurs. Actually a bigger diversity of mammals may even have been paired with a bigger diversity of dinosaurs. Oh, look, what a surprise. There was no serious discussion as a nutter had to crash the party. The article that you linked to is from 2009. And your ONLY concern is a 'nutter", eh? How about this? Have you ever watched some white birds in a field of cows? The birds sometimes can be seen ON the cows. What are they doing on the cows? Why, they are picking the biting insects off. It is a somewhat symbiotic relationship. Now, the relationship between early mammals and dinosaurs may have been somewhat similar to cows and white birds. Early mammals could have jumped on vegetation-eating dinosaurs to relieve them of giant mosquitos and other tasty morsels. Of course, when meat eaters like tyrannosaurus rex suddenly appeared, mammals scooted into their hidey-holes before they too, were eaten. Hmmm parasitism. Kind of reminds me of your role here at physorg pussytard. While many parasites such as hookworms are beneficial to the host, youre more of the tapeworm variety I think. Hey - you might want to try helminthic therapy. You might not need that catheter thing you were talking about in that other thread anymore. WHEN ARE YOU GONNA PROVIDE THE LINK (YOUR PROOF) THAT I, OR ANYONE ELSE EVER CLAIMED TO HAVE SEEN YOUR CLAIM OF SEEING "900 F00T TALL GLASSYHEADED MARTIANS (LAYING DOWN)? Excerpts of alleged comments are not acceptable as proof. I gave you one whole week to provide us with that proof and you thought you could get away with not providing it. Now get with it, Ottopussy and let everyone see your proof...or else apologize to me and everyone else for your being a lying, cheating, psychopathic, twisted idiot. Your comments offer proof that your brain is worm-infested. Do you fall down a lot and see spots before your eyes lately? "My troll sense is tingling. (You'll notice, mysticshakra, that I gave you the benefit of the doubt against plain old idiocy)"